July 24, 2014 Tom Coughlin Press Conference: The transcript and video from Thursday’s press conference with Head Coach Tom Coughlin are available at BigBlueInteractive.com and Giants.com. 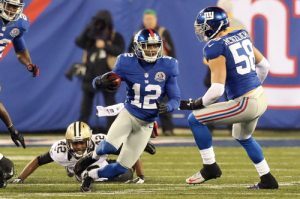 Another week, another edition of the Big Blue Breakdown on BigBlueInteractive.com. Today, our panel turns their attention to wide receiver Jerrel Jernigan. After failing to step foot on the field for the better part of two and a half seasons, Jernigan burst onto the scene towards the end of last year. The former third-round pick caught 19 passes for 237 yards and two touchdowns and also rushed for a 49-yard score. But where is Jernigan now? 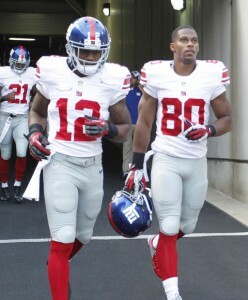 Odell Beckham Jr. was drafted, Trindon Holiday signed, Mario Manningham re-signed and Victor Cruz is now healthy. Is there a home for Jernigan; or will he get buried on the depth chart? Remember, if you’d like to submit a question to be debated on the Big Blue Breakdown, email Connor Hughes (Connor_Hughes@bigblueinteractive.com). QUESTION- From Jay in Toronto: Is there anything you’ve seen from Jerrel Jernigan so far to make you think he is continuing where he left off at the end of the season, or do you think that was a fluke? What do you see his role being on the team after the Giants drafted Odell Beckham Jr., do you think he can be a big contributor? It’s tough to see someone ‘flash’ or take much out of non-contact practices. To be honest, Jernigan hasn’t shown much more than Marcus Harris or Trindon Holliday. With that being said, I’m not terribly sure last year was a fluke. Whether it was or wasn’t, I don’t see where he fits into the offense. 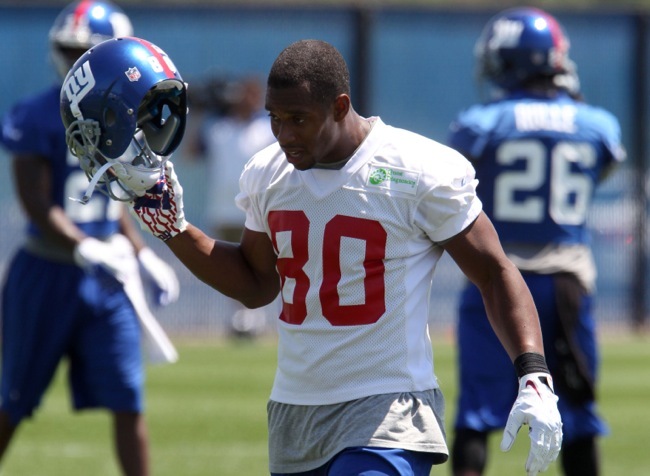 Jernigan plays primarily slot, a position Victor Cruz is most natural in. The Giants drafted Odell Beckham Jr. in the first round to be an ‘outside wide receiver’ with Rueben Randle, leaving Cruz in the middle. Where does that leave Jernigan? The bench. In the past, the Giants haven’t been big fans of four wide receiver sets, that could change this year, but I see that as the only chance Jernigan has at getting on the field other than injury. It’s not that he can’t play, it’s just I don’t see an open spot for him. Jernigan’s final three games of last season was an eye opener – to the Giants, to the fans and maybe even to himself. It prompted owner John Mara to publicly provide a statement of support in his post-season State of the Giants. Jernigan proved capable of getting open and, most importantly in my mind, an ability to make tough, contested catches despite his size. It had Mara wondering what took so long for the 2011 third-round pick to get on the field, a completely reasonable question considering his performance. No doubt, Jernigan showed that he can play at this level. He was the No. 2 scoring fantasy wide receiver over the final three weeks of the season with 19 catches, 237 yards and two touchdowns. It was an impressive three-game stretch during the first time in his career that he really received extended playing time. In my opinion, it wasn’t a fluke. Jernigan (5-8, 189) can play. His biggest problem, however, is that his ideal position is as a slot receiver. That happens to be the spot where the Giants’ top receiver, Victor Cruz, thrives. And Cruz isn’t going anywhere. Jernigan, even though some of his success last season came on the outside, is better suited for the slot. Once again, he’s unlikely to get that opportunity much this season as long as Cruz is healthy. That leaves him on the outside competing with first-round pick Odell Beckham Jr. and Rueben Randle for playing time. Advantage … first-round pick, and Randle has been ahead of Jernigan on the depth chart since the day he arrived. So, for now, Jernigan looks like an insurance policy rather than a significant contributor. He’ll be the backup plan in case something happens to Cruz, Beckham and Randle. Jernigan is a big question mark for me, to be honest. I thought John Mara’s end of season comment that “I’m not sure why it took us three years to find out that Jerrel Jernigan can play,” was made out of frustration and was really unfair to both Tom Coughlin and Kevin Gilbride. Fact is, the Giants had given Jernigan opportunities over the years, and he had continually come up short. Jernigan has the elusiveness to be a punt returner, but can’t consistently catch the ball. He has the ability to be a kickoff returner, but fumbled that chance away last year. As a receiver, he is a slot guy and Victor Cruz is better. If Jernigan was better than Cruz, he would have been playing. If he was better on the outside than Hakeem Nicks, Reuben Randle or Mario Manningham before he left for the San Francisco 49ers he would have been playing. Fact is, he wasn’t. Now, as for what to expect from him this season I just don’t know. Are we going to see the guy who caught 13 passes in his first 29 NFL games, of 19 in his last three? I think we will see a guy who has figured that, yes, he can play in the NFL. Do I think he will be a star? No. It will be interesting to see if he can get open if the Giants ask him to play on the outside more, or if Ben McAdoo will find ways to pair him with Cruz on the inside. It will also be interesting to see how many snaps Jernigan plays, since he is likely the No. 4 wide receiver. I would think the Giants would be thrilled with 35-45 catches from Jernigan in 2014. Well first, there’s nothing we’ve really seen from Jerrel Jernigan since the end of last season that would be able to really tell us anything. The few practices the media have attended have been light practices and the Giants are obviously busy installing a new offense, so it’s hard to really analyze him. Probably the biggest tell about his status, though, is that they drafted a receiver in the first round. If they were comfortable with him as their third receiver, I’m not sure they would have done that. So the simple answer is this: Barring injury, his role is as the fourth receiver at best, behind Victor Cruz, Rueben Randle and Beckham. I don’t know if I’d label his end of the season a fluke, though. It wasn’t the one-game flash we used to see from Ramses Barden. It was an impressive, three-game stretch. I don’t know that he’ll get that type of opportunity again, but I think it showed that he can be useful and productive in the right situations. He can be a weapon, and that’s important in this pass-happy era. A fourth receiver isn’t a huge part of an offense (when everyone is healthy) but it’s another player the defense needs to worry about. He showed speed, an ability to play above his 5-8 height, and the ability to get open and do something after the catch. So maybe the Giants will occasionally work him into the slot, either to spell Cruz or to let Cruz do more on the outside. Maybe he’s just a change-of-pace guy for certain plays, depending on how he fits into Ben McAdoo’s scheme. Maybe he’s mostly on the field in spread formations (which would be a help so they don’t always have to spread with extra running backs or tight ends). But I think they’ll find a use for him. He probably won’t consistently be the six-catch, 80-yard guy he was at the end of last season, but he could be good for a catch or two per game, he could be a valuable replacement when necessary, and might even have a few big plays in him as the year goes along. I’m probably going to be in the minority, but I don’t believe Jernigan is a lock to make the 53-man roster. I think he’s limited to filling two roles on this team, that as a slot receiver and as a return specialist. Since the fourth and fifth receiver (like the fourth and fifth cornerback, safety, linebacker, etc.) usually needs to be able to contribute something on special teams, I think that Jernigan might be facing an uphill battle to stick if he can’t show that he’s able to do both roles. I wrote about Jernigan possibly competing as a kickoff receiver for Bleacher Report last week. One thing I’ll add here is he’s had opportunities in each season he’s been in the league to emerge as a return specialist and that’s yet to happen, most likely due to ball security issues. All it seems to take for head coach Tom Coughlin and special teams coordinator Tom Quinn to replace a return specialist is one strike. When a return specialist has a nine percent fumble rate in his career, that’s not a good stat. I do not think that both Trindon Holliday, who in case you’re wondering, has an eight percent career fumble rate as a return specialist, and Jernigan are both going to make this roster. Holliday looked very good during the spring, but we need to temper our enthusiasm because as we all know, there are no pads allowed during the spring. 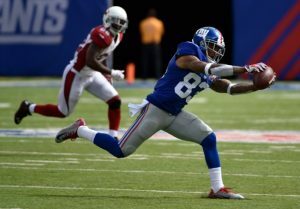 One other thing that we need to bear in mind is that in Ben McAdoo’s offense, Rueben Randle could very well be the other receiver we see working from the slot (besides Victor Cruz, who’s among the best in the NFL right now working from the slot). I think they like to try to create size mismatches in the slot, and so we’ll see if anything comes out of the talk of Randle seeing more snaps from the slot. So to answer the last part of the question, no, I don’t see Jernigan being a “big contributor” if he makes this team. I think your “big three” will be Rueben Randle, Cruz and Odell Beckham. 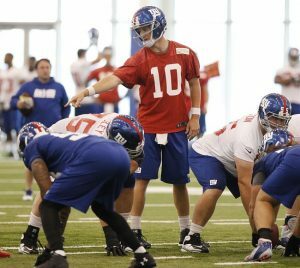 With the New York Giants reporting to camp in less than a month, BigBlueInteractive.com is breaking down each of the team’s positional groups from now until July 21. Today, let’s take a look at this year’s wide receivers. 2013 YEAR IN REVIEW: Well, it certainly wasn’t pretty. What was expected to be the team’s strength quickly turned into a great weakness. The quarterback wasn’t on the same page as the wide receivers, the receivers weren’t on the same page as the quarterback and when the two did mesh the offensive line didn’t Eli Manning enough time to get them the ball. There’s no other way to put it, the season was a complete disaster. Statistically, Victor Cruz (73-998-4), Hakeem Nicks (56-896-0) and Rueben Randle (41-611-6) never all clicked at the same time. One positive though, Jerrel Jernigan showed promise in the final two games of the season. 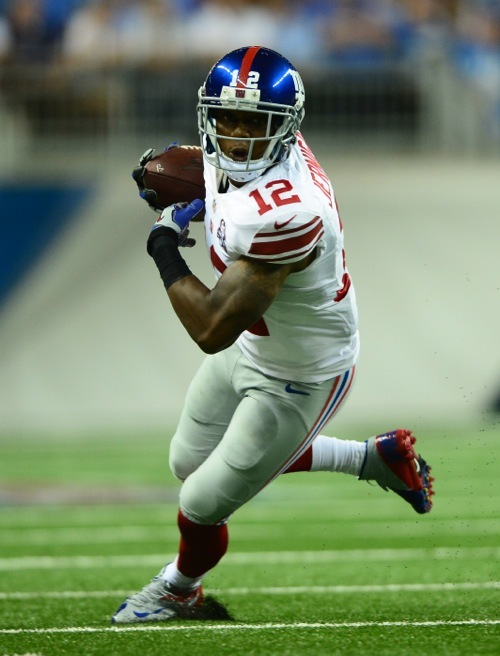 ADDITIONS/SUBTRACTIONS: The Giants added to the receiver meeting room quite a bit, both in free agency and the draft. Mario Manningham returns after two years in San Francisco and Trindon Holliday comes over from Denver. 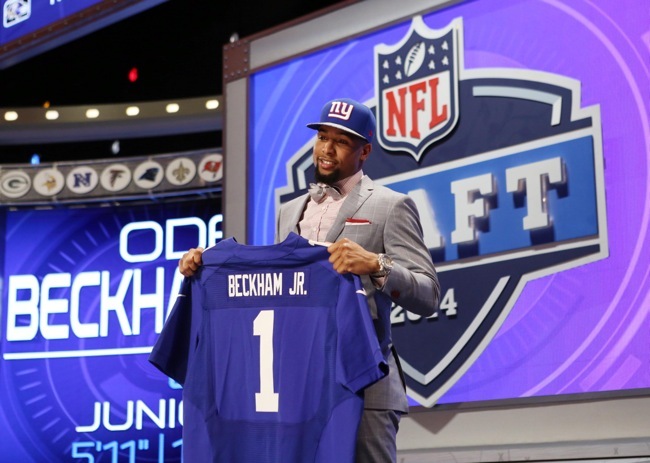 Odell Beckham Jr. was drafted in the first round out of LSU. A few names left via free agency, such as Hakeem Nicks (IND) and Louis Murphy (TB). TRAINING CAMP STORY LINES: Every wide receiver that played in Kevin Gilbride’s offense last year has said the same thing about new offensive coordinator Ben McAdoo’s system this year: Less reads, quick passes. 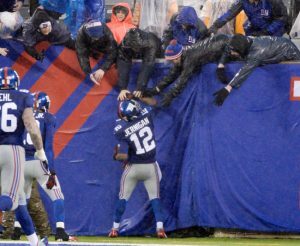 In the past, the Giants’ offense was predicated on stretching the field and going deep. Now, it appears as if those deep posts and streaks are quick slants and screens. It will be interesting to see how Gilbride’s wideouts fit into McAdoo’s offense. 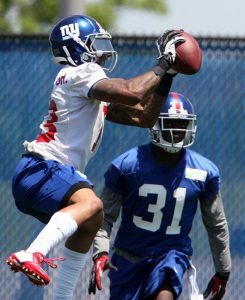 Cruz, Manningham and Beckham Jr. (in college) have all displayed the ability to make people miss with the ball in their hands; they may excel with McAdoo more than ever. The use of Trindon Holliday offensively and the health of Mario Manningham will also be interesting. Throughout the offseason conditioning program, Holliday flashed again…and again…and again. He’s very dangerous in space, but has seldom been used on offense. Can McAdoo find a spot on offense? When healthy, Manningham is a dominant deep threat who can cause people to miss in space. But..is he healthy? The 28-year-0ld didn’t participate in OTAs or mini-camp. ON THE BUBBLE: There’s the normal candidates who are fighting for a practice squad position (Corey Washington, Julian Talley, Preston Parker, Travis Harvey, Marcus Harris), but one name to keep an eye on as a potential cut is Mario Manningham. 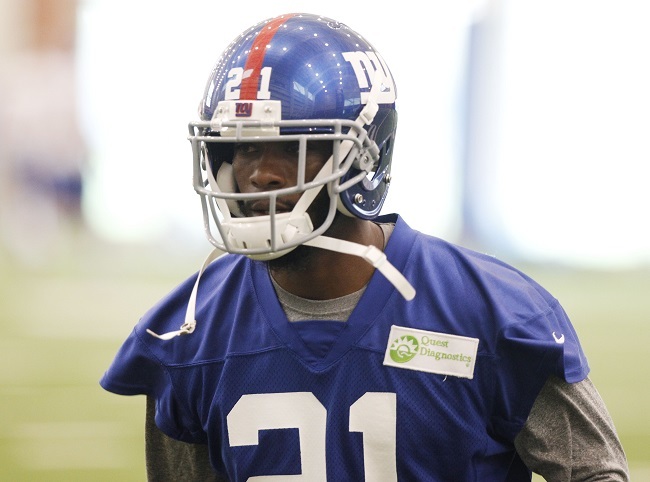 If the former second-round pick is finally healthy, he has a home with the Giants. If not? He could be cut in favor of another young target. The Giants have never been a team to give a roster spot to someone based on their name. Connor Hughes – I’m very, very intrigued to see what players like Victor Cruz, Odell Beckham Jr., Trindon Holliday, Jerrel Jernigan and Mario Manningham can do in Ben McAdoo’s new offense. Everything we’ve been told and seen throughout the offseason suggest a high-tempo, fast-paced, quick-pass offense that is predicated on getting the receiver the ball in space. We’ve seen Manningham have success in that role, Cruz too. Beckham Jr. did it all throughout college and Holliday as a returner. Gone are the long developing deep passes, I believe this offense fits these receivers perfectly. Then again, if Manning doesn’t have the time to get them the ball…none of it will matter. Eric Kennedy – Like Connor, I see a group of wide receivers who run well after the catch. 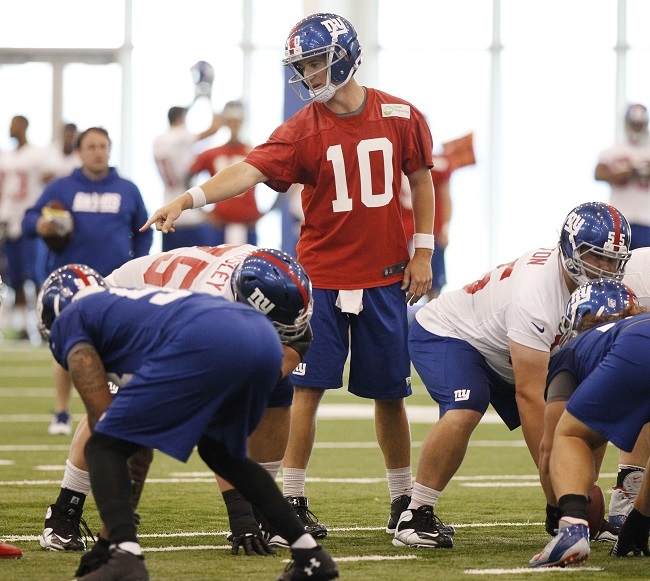 The key will be Eli’s ability to accurately hit them in stride in order for them to do damage after the reception. And while fewer reads reduces the mental strain on the quarterback and receivers, it also reduces the mental strain on the defense. Routes will be more predictable and there will be more pressure on receivers to physically beat opposing defensive backs to get open. The top three will undoubtedly be Victor Cruz, Odell Beckham, and Rueben Randle. 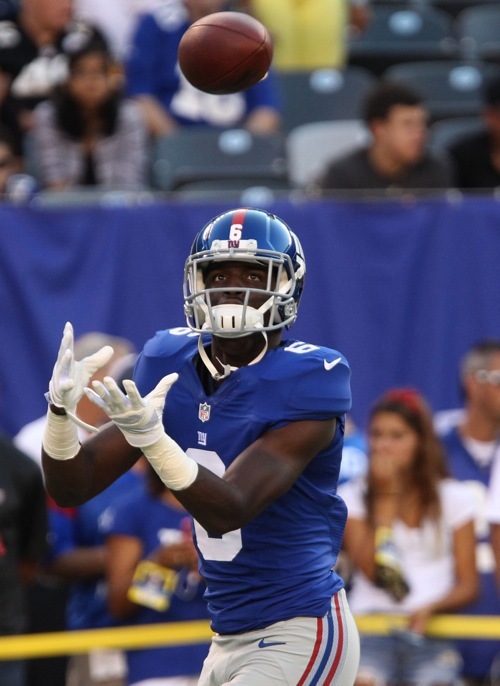 With defenses focusing on Cruz early, I look for Beckham and Randle to make a lot of big plays. Randle, more than anyone, seems more at peace with the new system. My “wild card” is Holliday. The Texans and Broncos never really used him on offense (two career catches). My gut tells me Ben McAdoo becomes enthralled with his play-making ability in space and designs a handful of plays for him per game. 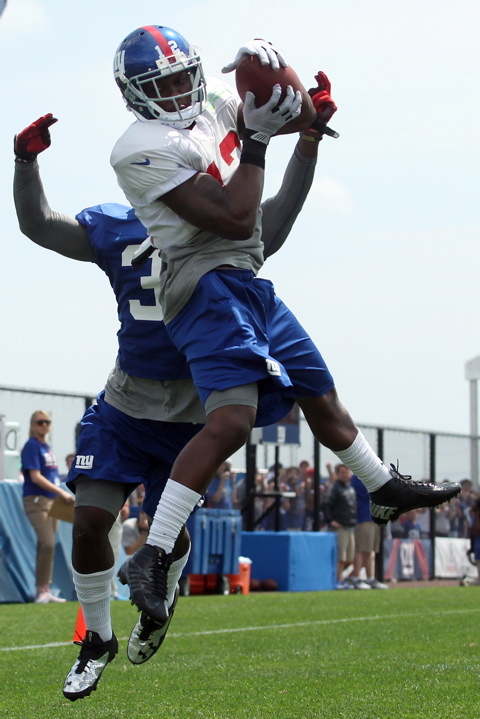 Connor Hughes – Odell Beckham Jr., Victor Cruz, Trindon Holliday, Jerrel Jernigan, Mario Manningham, Rueben Randle. 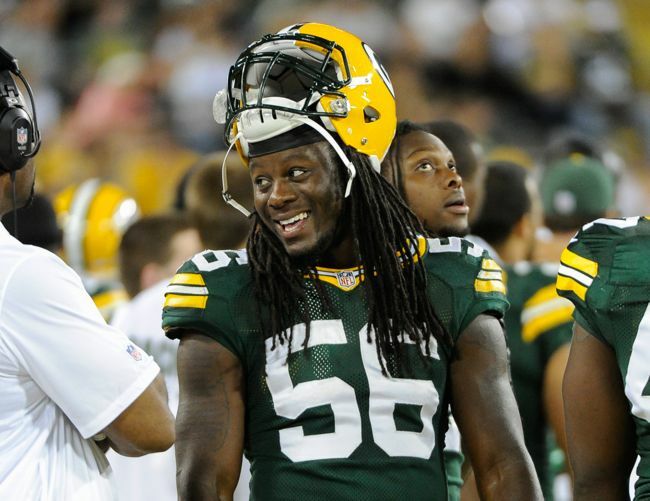 (Marcus Harris ends up on practice squad). 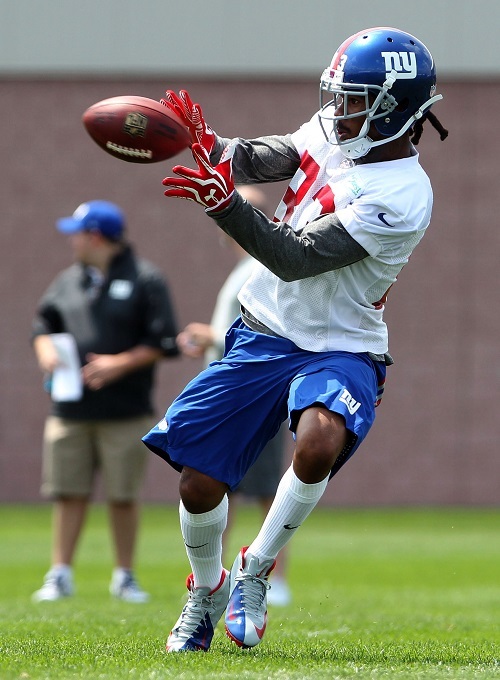 Eric Kennedy – Odell Beckham Jr., Victor Cruz, Rueben Randle, Trindon Holliday, Jerrel Jernigan, Marcus Harris. New York Giants Complete OTA Practices: The New York Giants held their tenth and last Organized Team Activity (OTA) practice on Friday. The media was not allowed to view Friday’s final OTA practice. The offseason program will culminate on June 17-19 with a mandatory, full-team mini-camp. The Giants will then be off until the players are required to report to summer training camp on July 21. 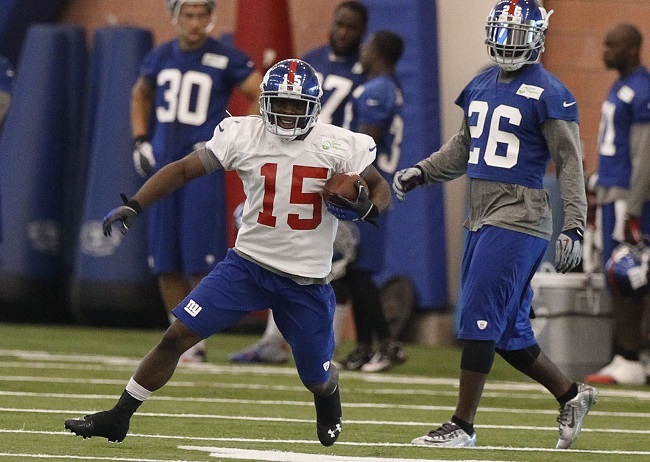 A sights and sounds video from the OTA practices is available from Giants.com. BloombergTV Interview with LG Geoff Schwartz: The video of Friday’s BloombergTV interview with LG Geoff Schwartz is available by Bloomberg.com. Ever since Kevin Gilbride was replaced as offensive coordinator by Ben McAdoo, there has been much media and fan speculation about what the new offense of the New York Giants might look like. When Head Coach Tom Coughlin came to New York in 2004, he brought along a passing game that featured more of a vertical, down-field passing attack. His first offensive coordinator was John Hufnagel, but Hufnagel was fired near the end of the 2006 season and replaced by Gilbride. 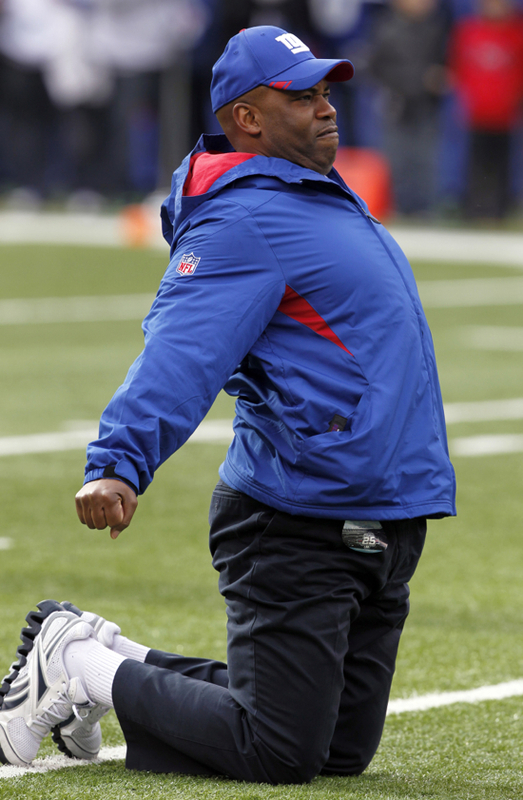 Tom Coughlin has always been about offensive balance. He wants a physical running game combined with a big-play passing game. Coach Coughlin does not want to dink-and-dunk the ball down the field, but gain yardage in big chunks. That formula worked well for him both with the Jaguars and Giants when he had the necessary talent. And it helped the New York Giants to win two NFL Championships. Based on comments from current players and observations from the three Organized Team Activity (OTA) practices open to the media, the Giants are changing their style. Ben McAdoo’s background is the West Coast Offense. In a nutshell, the Giants will emphasize stretching the field more horizontally instead of vertically. Though the team will still take its shots down the field, there will be more 3-step drops and an effort to get the ball quickly out of quarterback Eli Manning’s hands. The coaches want to get Eli into a comfortable rhythm throwing the football. More passes will be intended for the running backs and tight ends at the possible expense of the wide receivers. Ben McAdoo’s background is the West Coast Offense, serving as tight ends and later quarterbacks coach under Mike McCarthy with the Green Bay Packers. “This offense to me, and I’ve run a lot of West Coast with Mike Shanahan in Denver, a lot of stuff is similar,” said RB Peyton Hillis on Thursday. Hillis might serve in a similar capacity to John Kuhn in Green Bay, not so much from the standpoint of a traditional fullback, but more of a pass-receiving and rushing one-back. Making such a drastic change in offensive philosophy and terminology may not be quick and easy. Manning has never played in a West Coast system and neither have most of his offensive teammates. To date, the strength of Manning’s game has not been the short game, particularly screen and swing passes. And while running backs Rashad Jennings, Peyton Hillis, and David Wilson could thrive as pass receivers in this offense, the Giants lack proven talent at tight end. The interior of the offensive line has been overhauled and there are still huge health and ability question marks at left tackle and right guard. So the key question is when will the players become comfortable enough with the new system to where the learning curve does not cost them on the playing field? It could take the entire preseason. Worse, it could take the first half or even a full season of actual game experience. But once the system is learned, it could make life a lot easier for Eli and his receivers. In the new system, run-after-the-catch ability will be paramount. The good news is the Giants have some extremely dangerous receivers with the football in their hands, including Victor Cruz, Rueben Randle, Odell Beckham, Jerrell Jernigan, and Trindon Holliday. While all pro offenses use pre-snap and post-snap reads, based on early comments from the players, there will be fewer reads in this offense. That should make it more likely that quarterback and receivers are on the same page, causing fewer mental mistakes that turn into turnovers for the opposition. In particular, receivers such as Randle and Jernigan, who were very inconsistent in the old Coughlin-Gilbride system, may perform much better with fewer reads. Beckham, Jernigan, and Holliday are all particularly dangerous after the catch. Again, the learning curve will be an important factor. Beckham’s growth has been stymied somewhat by an early hamstring injury that caused him to miss most of the OTAs. While the West Coast Offense does place more emphasis on throws to the running backs and tight ends, one would think that Coach McAdoo is drawing up plays that would have Randle and Beckham outside with Cruz, Jernigan, and/or Holliday in the slot. Defensive Coordinator Perry Fewell Will Interview with Redskins on Monday: According to The NFL Network, New York Giants Defensive Coordinator Perry Fewell will interview with Washington Redskins on Monday for Washington’s head coaching vacancy. The Redskins asked and received permission to interview Fewell this past week after Mike Shanahan was fired as Washington’s head coach. Fewell became the Giants’ defensive coordinator in 2010 after Steve Spagnuolo left the Giants to become the new head coach of the St. Louis Rams. Giants.com Q&A with WR Jerrel Jernigan: The video of a recent Giants.com Q&A with WR Jerrel Jernigan is available at Giants.com. New York Giants 20 – Washington Redskins 6; Manning, Beatty, Brewer, Randle, and Nicks Hurt: The New York Giants defeated the Washington Redskins 20-6 on Sunday afternoon at a dreary, nearly-empty, rain-soaked MetLife Stadium in East Rutherford, New Jersey. 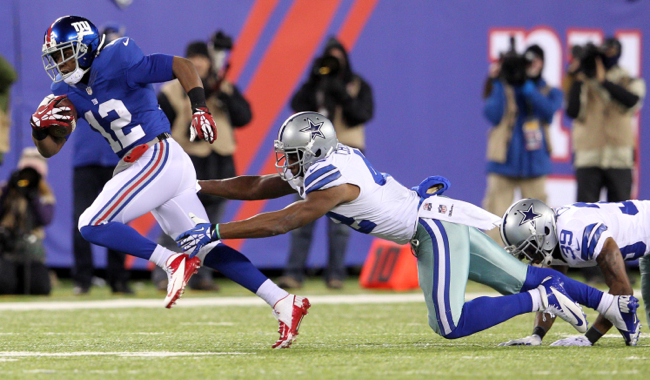 With the win, the Giants finished the 2013 NFL season with a 7-9 record (3-3 in the NFC East). 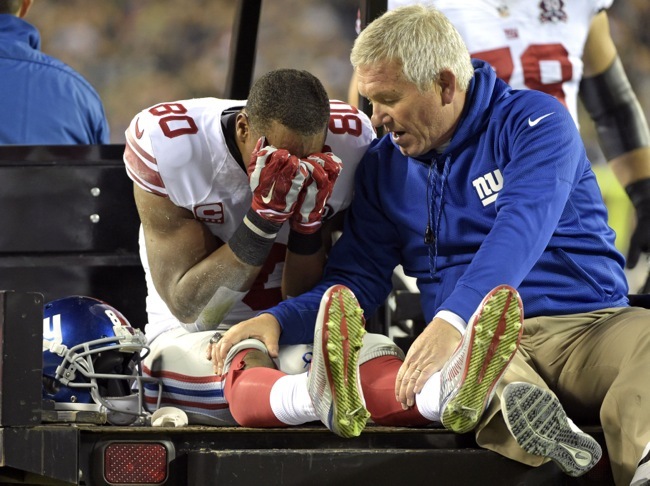 However, the real story was the game-ending injuries suffered by QB Eli Manning (high ankle sprain), LT Will Beatty (broken right leg), OG James Brewer (ankle), WR Rueben Randle (knee), and WR Hakeem Nicks (ankle). Beatty’s injury appears to be the worst of the bunch. He had to be carted from the field in the third quarter and Head Coach Tom Coughlin did not know the severity of the fracture after the game. Manning was using a walking boot and crutches after the contest. Brewer left the game early and was spotted wearing a walking boot in the locker room. Randle and Nicks left the game in the first half. Randle, who missed practice all week with a knee issue, said his departure was precautionary. Beatty’s availability for the 2014 season could be at risk. The injuries severely depleted an already undermanned Giants team. By the second half, the Giants were down to Jerrel Jernigan, Louis Murphy, and Julian Talley at wide receiver. Curtis Painter was at quarterback. And the offensive line consisted of Stephen Goodin, Dallas Reynolds, Kevin Boothe, David Diehl, and Justin Pugh. Offensively, aside from the play of WR Jerrel Jernigan, it was an ugly game for the Giants. Not counting the ends of both halves, the Giants had 16 offensive possessions. Eight ended with punts, one with a missed field goal, three with turnovers, and four with scores. Jernigan scored both touchdowns, one on a 24-yard pass from Manning in the second quarter and the other on a 49-yard end around in the third quarter. The Giants were held to 14 first downs, 3-of-14 on third down, and only gained 278 total net yards (122 yards rushing and 156 yards passing). Defensively, the Giants did a number on the Redskins, holding Washington to 12 first downs, 5-of-20 on third down, and 251 net yards (91 yards rushing and 160 yards passing). Most importantly, the Giants kept the Redskins out of the end zone despite turnovers that gave the Redskins the ball at the Giants’ 18 and Redskins’ 46 yard lines. 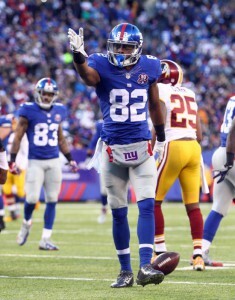 The Giants held the Redskins to two first downs in the first half. And for the game, in 17 offensive possessions, the Redskins punted nine times, turned the ball over four times, turned the ball over on downs twice, and kicked two field goals. Eli Manning finished the game 10-of-24 for 152 yards, 1 touchdown, and 1 interception. QB Curtis Painter, who played the entire second half, finished the game 2-of-8 for 11 yards, 0 touchdowns, and 1 interception. RB Peyton Hillis carried the ball 17 times for 56 yards. RB Andre Brown only managed 11 yards on 13 carries and also fumbled the ball away. Jernigan was the leading rusher (two carries for 57 yards and a touchdown) and receiver (6 catches for 90 yards and a touchdown). On the defensive side of the ball, MLB Jon Beason led the team with 9 tackles. DE Justin Tuck had 6 tackles, 2 sacks, and forced a fumble. DT Cullen Jenkins had 4 tackles, 1 sack, and forced a fumble. DT Linval Joseph and LB Keith Rivers both recovered fumbles. CB Trumaine McBride picked off two passes and had six pass defenses. Video highlights are available at Giants.com, as is the video of the post-game locker room celebration. Post-Game Injury Report: QB Eli Manning (high ankle sprain), LT Will Beatty (fractured right leg), OG James Brewer (ankle), WR Rueben Randle (knee), and WR Hakeem Nicks (ankle) all left the game and did not return. OG David Diehl revealed he will need thumb surgery in the offseason. CB Terrell Thomas revealed that he not only underwent his third ACL repair in the 2013 offseason but he also had microfracture surgery. Head Coach Tom Coughlin’s Post-Game Press Conference: The transcript and video of Head Coach Tom Coughlin’s post-game press conference are available at Giants.com. New York Giants Will Pick 12th in 2014 NFL Draft: The Giants will pick 12th in the first round of the 2014 NFL Draft. New York Giants Post-Game Notes: Inactive for the Giants were QB Ryan Nassib, WR Victor Cruz (knee), TE Adrien Robinson (knee), OG Brandon Mosley (hand), OG Eric Herman, DE Jason Pierre-Paul (shoulder), LB Allen Bradford. The Giants started the season 0-6 and finished 7-3 in the last 10 games. The Giants finished the 2013 NFL season 4-4 at home and 3-5 on the road. The Giants finished third in the NFC East for the second season in a row. All nine of the Giants’ losses were to teams that finished .500 or better. The Giants finished the season with an average of just 83.3 yards on the ground, their lowest season-long average since they rushed for 76.9 yards a game in 1945. The Giants turned the football at least once in every game this season. Tom Coughlin won his 90th regular-season game as the Giants’ head coach. He is just the second coach in franchise history to reach that plateau (Steve Owen had 153). QB Eli Manning’s first and last passes of the season were each intercepted. Manning was sacked 39 times this season. 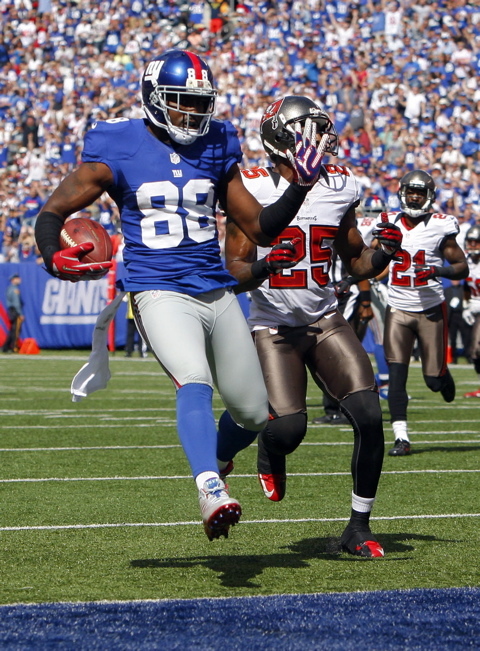 WR Jerrel Jernigan’s 49-yard touchdown run was the longest by a Giants wide receiver since the 1970 merger. In addition, it was the longest run by a Giant this season. This is the first time since the merger the Giants’ longest run was by a wide receiver. DE Justin Tuck finished the season with 11 sacks, the third-highest total of his career and the fourth double-digit sack season in Tuck’s nine Giants seasons. Despite missing a 50-yard field goal, PK Josh Brown made 23-of-26 field goal attempts this season, a percentage of 88.5 that is third-highest in Giants history (minimum 15 attempts). Justin Pugh started at right tackle, as he did in every game this season, becoming the first Giants rookie to start an entire 16-game season since defensive tackle Barry Cofield in 2006. David Diehl returned to the starting lineup at right guard. It was Diehl’s 164th regular-season game in a Giants uniform, tying him with quarterback Phil Simms for 12th place on the franchise’s career list. Diehl started 160 of those games, including 11 this season.